Imagine someone grabs your hand right now and says, “It’s time to go.” He pulls you over to the door and begins forcing you into your jacket. You struggle to get free, but his grip is too strong. He gets one arm and then the other into the coat sleeves. Then, he leads you out the door. He picks you up and puts you in his car. Now, imagine you are three years old. This is an all too common “transition” for many children. We rush to get them outside so we can get to the next activity. But, what if dressing is the activity? 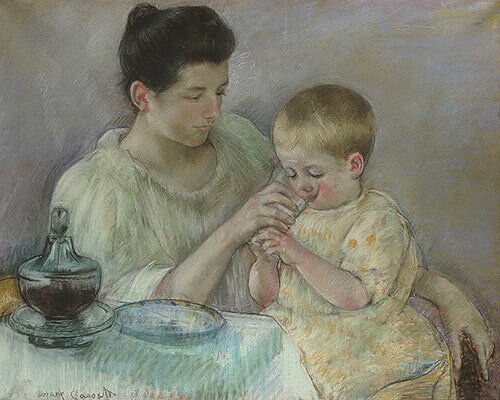 Many mothers believe that they are caring for their children best when they do everything as fast as possible: “One, two, three and done!” That’s not the way to be. Whenever we are doing something with a child, we should never be in a hurry. Even in the speed of our motions we should adjust to the child, who prefers it when we are calm and take time with him. Emmi Pikler’s insights into the young child are a great source of inspiration for me. Observing caregiving moments at the Pikler Institute offer a model of how respect for the young child can be put into action. Here you can see a video of some caregiving moments at the Pikler Institute. The caregiver is speaking Hungarian, the subtitles are in German and yet the message is universal. 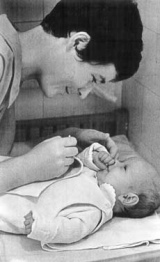 Notice at :25 how the caregiver picks up and carries and lays down the baby — slowly, allowing the baby to gently adjust to the change and offering security through her movements, touch and voice. Notice at 2:55 how the nurse offers security by placing her hand on the baby as she puts the clothes in the dirty laundry and then reconnects with the baby with her gesture and voice. Notice at 5:55 how the baby responds to the caregiver and how the caregiver responds to the baby — the connection between the two. Notice at 8:37 the eye contact between the caregiver and child — truly meeting each other in the moment. But, my point is not that we should watch the video and copy the moves. I heard it said at the Pikler Institute that caregivers love the children because they care for them, but, as parents, we care for our children because we love them. The caregivers at the Pikler Institute had the professional responsibility to follow the method outlined by Pikler exactly — in this way offering therapeutic care for young children living in a residential nursery. Teachers and care providers also must find their own consistent and respectful style of care in order to build a trusting relationship with children that they watch over. But, as parents, we need to have reasonable expectations of ourselves, and feel free to be spontaneous and natural. We can discover through the work of Pikler and other innovative childcare models qualities that we want to impart on our children during caregiving moments so that we can find ways to offer loving care within a natural family rhythm. We shared examples in our lives on how we already bring these gifts to our children. And we shared our challenges and struggles. It felt so supportive to hear both! For example: Get things ready for an outing the night before so that you don’t have to rush around so much in the morning. For example: 30 minutes is likely not enough time to get 3 children under the age of 5 years old in the car. For example: If your child isn’t ready to clear her dish from the table, let her know that you will wait for her to be ready. Give her a little time and she may just come back on her own to complete the task. For example: How would you feel if your sleeve bunched up when putting on your coat? Recognize that caregiving experiences offer us time for deep connection with our child. For example: Find moments where you can listen fully present — and, as parents of young children, that may mean scheduling a time or going on a date. Be respectful when requesting help. For example: If things are getting overwhelming during the transition to dinner time, don’t bark orders to your spouse. Think of your need as an opportunity to practice mutual care. Offer impromptu neck massages, cuddles and kisses. There are so many benefits to kissing and physical affection. Model loving care for our children. Our children are learning how to care for others by how we care for others. Let’s be worthy of their imitation. Make self-care part of your daily routine. For example: If you set a timer and meditate at the same time every morning, your child can learn to join you quietly or play on their own. For example: Don’t feed your child and forget to eat yourself. Prioritize your own nutritional needs. For example: If you draw a hot bath and pour a glass of wine… remember to lock the door before getting in the water. Recognize the opportunity for care in everyday moments. For example: Check in with yourself periodically to see if you have an inward attitude of respect, love and compassion for yourself. In the same way that children learn how to care for others by how we care for others, they also learn how to care for themselves by how we care for ourselves. By reflecting back on the values we hold we can discover and practice compassionate and respectful care for our children, others and ourselves. What are words that you would add to our list of qualities to strive for during caregiving moments? What are gifts and challenges that you find in caring for your children, spouse, parents, friends and yourself? Thank you Vanessa for your time on Saturday. Its just what we needed. We felt stuck in some aspects of our parenting. The list of qualities of a caregiver are a gentle reminder for us to go over in our heads throughout our day to strive to be more present with our son and ourselves. Thank you. A word I would add to the list is “trust”. Trust our intuition of parenting. Trust our son’s unique path in life and to trust there is a higher spiritual power in all of us. Thank you Kali for coming on Saturday and for your thoughtful comment. I completely agree about the importance of trust on all levels for caregiving. I have added it to the list officially. I’m so glad to be connected with you and your work. Thank you!